You can Split Test any of your pages with ConversionFly. Simply click on the SPLIT TEST tab (screen shot below) to open up the form fields to manage an A/B Split Test. Second URL: This is the URL of the second page that you’d like to forward traffic to for the split test. Split Test Name: This is what you’d like to name this Split Test. Winning Goal Page Type: You can set the parameter of what ConversionFly looks for when determining the winning page of this split test. Either SALES or LEADS. Split Test Percentage: This is the percentage of traffic that you’d like to forward for this split test. 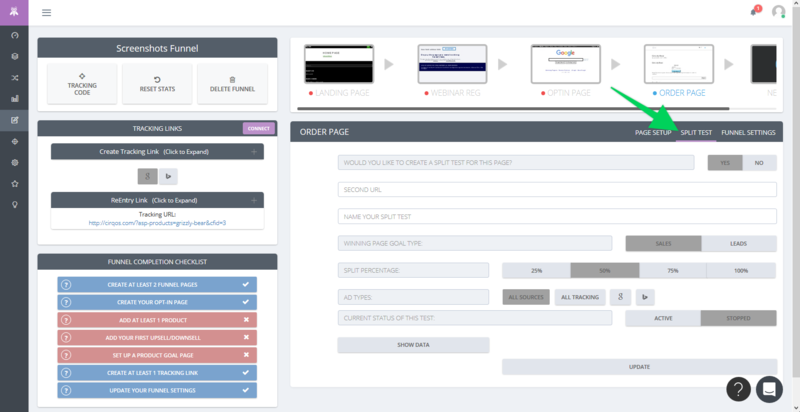 25% means 1 out of 4 visitors will be forwarded to the split test page, 50% means half of all visitors are forwarded etc. Ad Types: This determines which traffic will be forwarded when split testing. If you’d like all traffic to be forwarded you would select ALL SOURCES or you can choose to split test only traffic that is coming from a specific Ad Type or All Tracking Links. Status: This can be either set to ACTIVE or STOPPED. If you click on the SHOW DATA button, it will expand a data table containing your Split Test traffic and statistics. If the Split Test has not yet begun then there will be no data shown.